Select a help topic below. Click any image to view larger. Once you login, you’ll see the WordPress Dashboard. On the left hand side, you’ll see a menu with several options. 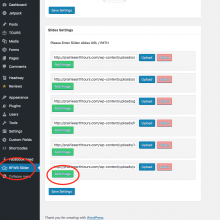 Below is overview of some of the basic WordPress options. You can also view your website statistics from the dashboard. Media This is the library of images used on your website. You can view basic stats by clicking Dashboard in the left hand column. 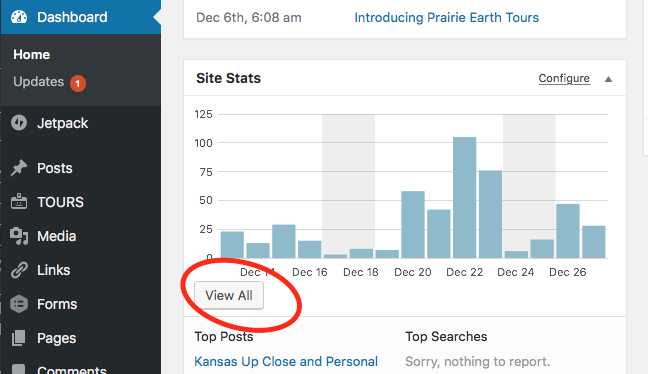 These basic statistics show you Page Views. Page views are the total number of times the page was accessed. You can click the View All button to see more data. On this page, you can click Show Summaries in the upper right for weekly and monthly page view summaries, with percentage change. Click Pages or All Pages to see a list of your existing pages. Hover over the Page Title (e.g. About in the sample image at left) in the list of pages to see editing links. Click Edit to modify the specified page. Once you click Edit, you’ll be taken to the WordPress editor screen. The WordPress editor is similar to software such as Microsoft Word, and you can make your text changes here. For more specific instructions and tips for the WordPress editor, click here. After you have completed your editing, save your changes by clicking the blue Publish button in the top-right. Navigate as you normally would to the page you want to edit. Once you click Edit Page, you’ll be taken to the WordPress Editor screen. 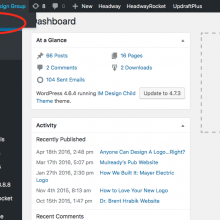 The WordPress editor is similar to software such as Microsoft Word, and you can make your text changes here. For more specific instructions and tips for the WordPress editor, click here. Type or paste your text into the main editor. 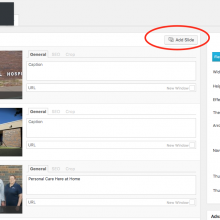 Optional: Add a large photo at the top of your page by clicking Set Featured Image in the right hand column. 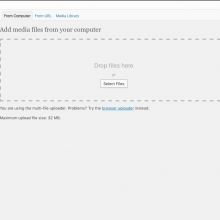 Near the top left, click the tab that says Upload Files. 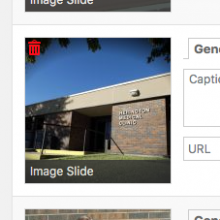 You can then select a file from your computer, and then click the Set Featured Image button near the bottom right. Click the blue Publish button on the right hand side. One you have created a page, it will need to be added to main menu. See below. Blog posts stack in order from newest to oldest. 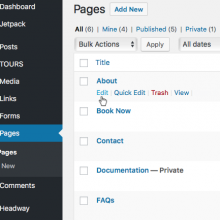 You’ll use the WordPress editor whenever you create or edit pages or posts. Below is a quick overview of the different areas of the editor. Body of your post or page. Like most text editors, you have options to make bold and italic text, lists, quotes, or to change the alignment of your text. 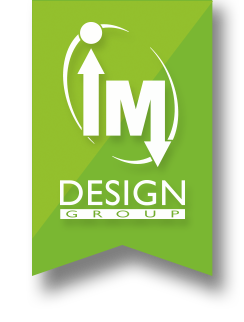 Publish button (A post or page must be Published to be visible to the public on your website). Note: On existing pages or posts, this button says Update rather than Publish. 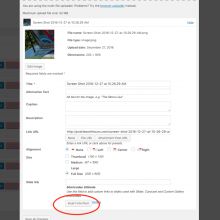 Change the publish date of any post or page. Can be set to a future date to pre-schedule a blog post. 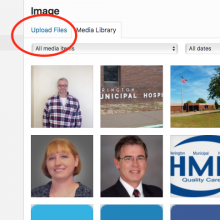 Add a photo or a gallery of multiple images to the BODY of your post by clicking Add Media. You can add as many images as you want in the body area. Add a large, feature photo to the top of your post by clicking Set Featured Image. Horizontal images work best. Photos will be automatically cropped to the right size. You can have only ONE featured image per page/post. Add a link by highlighting the text you want to link, and clicking on the Chain Link button. You can easily add links to other sites. 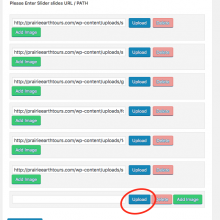 For example, if you want the words “click here” to be a hyperlink to another site, just type “click here” into your WordPress post. Highlight the text, and click the button above that looks like a chain link. You’ll get a pop up window where you can paste in the URL of a link. 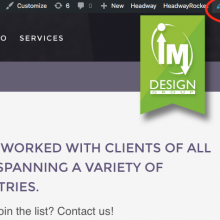 Also, within this pop-up window, you can link to other posts or pages on your own site by clicking the icon that looks a Gear symbol, and selecting the post or page from the drop down list. YouTube videos will automatically embed into your post. Go to YouTube and find the video you want to add. Copy the URL address of the video (i.e., http://www.youtube.com/example123), and then paste that into your post. Click on Set Featured Image in the right hand column. You’ll get a pop up window – You may drag and drop an image onto this window, or click “select files” and locate the photo on your computer. Click the blue button in the lower right corner that says “Set featured image” to add it to your page or post. 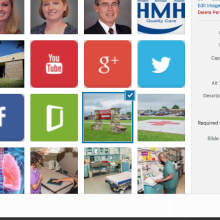 Adding a featured image will display your photo as a large, full width image at the top of your page/post. 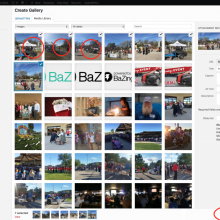 Featured images are automatically cropped to the same size, which gives a consistent look to your page/post. Each page/post can only have one featured image. 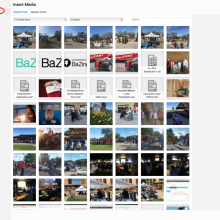 All featured images are horizontal, so if you want to add a vertical or square image, it’s best to use method two. Click anywhere in the body (text) of your page/post, and then click the button that says “add media” above. You’ll get a pop up window – You may drag and drop an image onto this window, or click “select files” and locate the photo on your computer. Click the blue button in the lower right corner that says “Insert into post” to add it to your post. Once the image appears within your document, you can click on it to change it’s alignment (center, left, right, none) or drag the corners to resize it. You can add as many images in the body of your page/post as you want, resize and align them as you like. To edit the gallery after it’s been inserted into your post, click any image and then the pencil icon. After clicking the pencil icon, you can change the order, add captions, delete images or add more images by clicking Add to Gallery on the right. 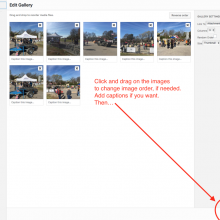 GALLERIES: Step 4 Drag and drop to reorder or add captions if you wish. Click Insert Gallery when finished. GALLERIES: To edit an existing gallery, click anywhere in gallery and then click the pencil icon. Status A post or page can be saved as a draft, published, or pending review. ONLY posts/pages that are “published” will be visible to the public on your website. You can start writing a post or page, save it as draft, and finish it later. You could also mark your post/page as “pending review” to let another co-worker know to read over it before publishing it. Even after a post or page has been “published”, you can always go back and edit it, delete it, or move it back into draft mode. Visibility ONLY posts or pages that are “public” will be visible to public users of your website. You can also mark posts/pages as “Private” or password protect a post. Publish Date You can edit this date on ANY post or page, but it is espescially useful for blogging. You can pre-schedule blog posts by setting a future date, and the post will automatically appear on that date. Also, remember that posts stack on top of each other in descending order from newest to oldest. If you want one post to appear before another, you can edit its date to change its order in the stack. Create your new page first. See Adding New Pages above if you need more info. Select your page in the left hand column. If you don’t see it under the Most Recent tab, click the View All tab or the Search tab to find the page you created. Your page will be added at the bottom of the menu list. You may drag and drop it elsewhere. To make your page a submenu of another item, drag it slightly to the right so that it is indented. Menus can be a bit tricky. Please call us 620-343-3909 or email [email protected] if you need help. Hover over the image until a red trash can icon appears in the top left corner of the image. Click the trash icon to delete. Click Insert into Post. You shouldn’t need to change any other settings in this box.